Proprietary Name: Tramadol Hydrochloride What is the Proprietary Name? Non-Proprietary Name: Tramadol Hydrochloride What is the Non-Proprietary Name? 68788 - Preferred Pharmaceuticals Inc.
Tramadol Hydrochloride with NDC 68788-7321 is a a human prescription drug product labeled by Preferred Pharmaceuticals Inc.. The generic name of Tramadol Hydrochloride is tramadol hydrochloride. The product's dosage form is tablet and is administered via oral form. Labeler Name: Preferred Pharmaceuticals Inc.
DEA Schedule: Schedule IV (CIV) Substances What is the Drug Enforcement Administration (DEA) CIV Schedule? The controlled substances in the CIV schedule have an abuse potential and dependence liability less than those listed in CIII and have an accepted medical use in the United States. FDA Application Number: ANDA075964 What is the FDA Application Number? ADDICTION, ABUSE AND MISUSETramadol hydrochloride tablets expose patients and other users to the risks of opioid addiction, abuse and misuse, which can lead to overdose and death. Assess each patient's risk prior to prescribing tramadol hydrochloride tablets, and monitor all patients regularly for the development of these behaviors and conditions (see WARNINGS).OPIOID ANALGESIC RISK EVALUATION AND MITIGATION STRATEGY (REMS):To ensure that the benefits of opioid analgesics outweigh the risks of addiction, abuse, and misuse, the Food and Drug Administration (FDA) has required a REMS for these products (see WARNINGS). Under the requirements of the REMS, drug companies with approved opioid analgesic products must make REMS-compliant education programs available to healthcare providers. Healthcare providers are strongly encouraged to •complete a REMS-compliant education program, •counsel patients and/or their caregivers, with every prescription, on safe use, serious risks, storage, and disposal of these products, •emphasize to patients and their caregivers the importance of reading the Medication Guide every time it is provided by their pharmacist, and •consider other tools to improve patient, household, and community safety.LIFE-THREATENING RESPIRATORY DEPRESSIONSerious, life-threatening, or fatal respiratory depression may occur with use of tramadol hydrochloride tablets. Monitor for respiratory depression, especially during initiation of tramadol hydrochloride tablets or following a dose increase (see WARNINGS).ACCIDENTAL INGESTIONAccidental ingestion of tramadol hydrochloride tablets, especially by children, can be fatal. (see WARNINGS).ULTRA-RAPID METABOLISM OF TRAMADOL AND OTHER RISK FACTORS FOR LIFE-THREATENING RESPIRATORY DEPRESSION IN CHILDRENLife-threatening respiratory depression and death have occurred in children who received tramadol. Some of the reported cases followed tonsillectomy and/or adenoidectomy; in atleast one case, the child had evidence of being an ultra-rapid metabolizer of tramadol due to a CYP2D6 polymorphism (see WARNINGS). Tramadol hydrochloride tablets are contraindicated in children younger than 12 years of age and in children younger than 18 years of age following tonsillectomy and/or adenoidectomy (see CONTRAINDICATIONS). Avoid the use of tramadol hydrochloride tablets in adolescents 12 to 18 years of age who have other risk factors that may increase their sensitivity to the respiratory depressant effects of tramadol (see WARNINGS).NEONATAL OPIOID WITHDRAWAL SYNDROMEProlonged use of tramadol hydrochloride tablets during pregnancy can result in neonatal opioid withdrawal syndrome, which may be life-threatening if not recognized and treated, and requires management according to protocols developed by neonatology experts. If opioid use is required for a prolonged period in a pregnant woman, advise the patient of the risk of neonatal opioid withdrawal syndrome and ensure that appropriate treatment will be available (see WARNINGS).INTERACTIONS WITH DRUGS AFFECTING CYTOCHROME P450 ISOENZYMESThe effects of concomitant use or discontinuation of cytochrome P450 3A4 inducers, 3A4 inhibitors, or 2D6 inhibitors with tramadol are complex. Use of cytochrome P450 3A4 inducers, 3A4 inhibitors, or 2D6 inhibitors with tramadol hydrochloride tablets requires careful consideration of the effects on the parent drug, tramadol, and the active metabolite, M1 (see WARNINGS, PRECAUTIONS; Drug Interactions).RISKS FROM CONCOMITANT USE WITH BENZODIAZEPINES OR OTHER CNS DEPRESSANTSConcomitant use of opioids with benzodiazepines or other central nervous system (CNS) depressants, including alcohol, may result in profound sedation, respiratory depression, coma, and death (see WARNINGS, PRECAUTIONS; Drug Interactions). •Reserve concomitant prescribing of tramadol hydrochloride tablets and benzodiazepines or other CNS depressants for use in patients for whom alternative treatment options are inadequate. •Limit treatment to the minimum effective dosages and durations. •Follow patients for signs and symptoms of respiratory depression and sedation. Tramadol hydrochloride tablets, USP are an opioid agonist. The chemical name for tramadol hydrochloride, USP is (±)cis-2-[(dimethylamino)methyl]-1-(3-methoxyphenyl) cyclohexanol hydrochloride. Its structural formula is:Molecular formula is C16H13NO2•HClThe molecular weight of tramadol hydrochloride is 299.8. Tramadol hydrochloride, USP is a white, bitter, crystalline and odorless powder. It is readily soluble in water and ethanol and has a pKa of 9.41. The n-octanol/ water log partition coefficient (logP) is 1.35 at pH 7. Tramadol hydrochloride tablets, USP, contain 50 mg of tramadol hydrochloride, USP, and are white in color. Inactive ingredients in the tablets are pregelatinized starch, lactose anhydrous, magnesium stearate, microcrystalline cellulose, polyethylene glycol, sodium starch glycolate, titanium dioxide, hypromellose and polysorbate 80. Tramadol hydrochloride tablets contain tramadol, an opioid agonist and inhibitor of norepinephrine and serotonin reuptake. Although the mode of action is not completely understood, the analgesic effect of tramadol is believed to be due to both binding to μ-opioid receptors and weak inhibition of re-uptake of norepinephrine and serotonin.Opioid activity is due to both low affinity binding of the parent compound and higher affinity binding of the O-demethylated metabolite M1 to μ-opioid receptors. In animal models, M1 is up to 6 times more potent than tramadol in producing analgesia and 200 times more potent in μ-opioid binding. Tramadol-induced analgesia is only partially antagonized by the opiate antagonist naloxone in several animal tests. The relative contribution of both tramadol and M1 to human analgesia is dependent upon the plasma concentrations of each compound (see CLINICAL PHARMACOLOGY; Pharmacokinetics).Tramadol has been shown to inhibit reuptake of norepinephrine and serotonin in vitro, as have some other opioid analgesics. These mechanisms may contribute independently to the overall analgesic profile of tramadol. Analgesia in humans begins approximately within one hour after administration and reaches a peak in approximately two to three hours. Effects on the Central Nervous SystemTramadol produces respiratory depression by direct action on brain stem respiratory centers. The respiratory depression involves a reduction in the responsiveness of the brain stem respiratory centers to both increases in carbon dioxide tension and electrical stimulation.Tramadol causes miosis, even in total darkness. Pinpoint pupils are a sign of opioid overdose but are not pathognomonic (e.g., pontine lesions of hemorrhagic or ischemic origins may produce similar findings). Marked mydriasis rather than miosis may be seen due to hypoxia in overdose situations.Effects on the Gastrointestinal Tract and Other Smooth MuscleTramadol causes a reduction in motility associated with an increase in smooth muscle tone in the antrum of the stomach and duodenum. Digestion of food in the small intestine is delayed and propulsive contractions are decreased. Propulsive peristaltic waves in the colon are decreased, while tone may be increased to the point of spasm resulting in constipation. Other opioid-induced effects may include a reduction in biliary and pancreatic secretions, spasm of sphincter of Oddi, and transient elevations in serum amylase.Effects on the Cardiovascular SystemTramadol produces peripheral vasodilation, which may result in orthostatic hypotension or syncope. Manifestations of peripheral vasodilation may include pruritus, flushing, red eyes, sweating and/or orthostatic hypotension.The effect of oral tramadol on the QTcF interval was evaluated in a double-blind, randomized, four-way crossover, placebo and positive-(moxifloxacin) controlled study in 68 adult male and female healthy subjects. At a 600 mg/day dose (1.5-fold the maximum immediate-release daily dose), the study demonstrated no significant effect on the QTcF interval.Effects on the Endocrine SystemOpioids inhibit the secretion of adrenocorticotropic hormone (ACTH), cortisol, and luteinizing hormone (LH) in humans. They also stimulate prolactin, growth hormone (GH) secretion, and pancreatic secretion of insulin and glucagon (see WARNINGS; ADVERSE REACTIONS).Chronic use of opioids may influence the hypothalamic-pituitary-gonadal axis, leading to androgen deficiency that may manifest as low libido, impotence, erectile dysfunction, amenorrhea, or infertility. The causal role of opioids in the clinical syndrome of hypogonadism is unknown because the various medical, physical, lifestyle, and psychological stressors that may influence gonadal hormone levels have not been adequately controlled for in studies conducted to date (see ADVERSE REACTIONS).Effects on the Immune SystemOpioids have been shown to have a variety of effects on components of the immune system in in vitro and animal models. The clinical significance of these findings is unknown. Overall, the effects of opioids appear to be modestly immunosuppressive.Concentration–Efficacy RelationshipsThe minimum effective analgesic concentration will vary widely among patients, especially among patients who have been previously treated with potent opioid agonists. 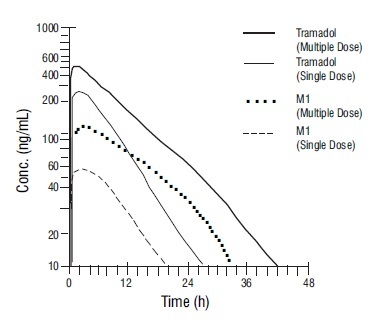 The minimum effective analgesic concentration of tramadol for any individual patient may increase over time due to an increase in pain, the development of a new pain syndrome and/or the development of analgesic tolerance (see DOSAGE AND ADMINISTRATION).Concentration–Adverse Reaction RelationshipsThere is a relationship between increasing tramadol plasma concentration and increasing frequency of dose-related opioid adverse reactions such as nausea, vomiting, CNS effects, and respiratory depression. In opioid-tolerant patients, the situation may be altered by the development of tolerance to opioid-related adverse reactions (see DOSAGE AND ADMINISTRATION). The analgesic activity of tramadol hydrochloride tablets is due to both parent drug and the M1 metabolite (see CLINICAL PHARMACOLOGY; Pharmacodynamics). Tramadol is administered as a racemate and both the [-] and [+] forms of both tramadol and M1 are detected in the circulation. Linear pharmacokinetics have been observed following multiple doses of 50 and 100 mg to steady-state. Oral administration of tramadol hydrochloride tablets with food does not significantly affect its rate or extent of absorption, therefore, tramadol hydrochloride tablets can be administered without regard to food. The volume of distribution of tramadol was 2.6 and 2.9 liters/kg in male and female subjects, respectively, following a 100 mg intravenous dose. The binding of tramadol to human plasma proteins is approximately 20% and binding also appears to be independent of concentration up to 10 mcg/mL. Saturation of plasma protein binding occurs only at concentrations outside the clinically relevant range. Tramadol is eliminated primarily through metabolism by the liver and the metabolites are eliminated primarily by the kidneys. The mean (%CV) apparent total clearance of tramadol after a single 100 mg oral dose is 8.50 (31) mL/min/kg. The mean terminal plasma elimination half-lives of racemic tramadol and racemic M1 are 6.3 ± 1.4 and 7.4 ± 1.4 hours, respectively. The plasma elimination half-life of racemic tramadol increased from approximately six hours to seven hours upon multiple dosing. Metabolism Tramadol is extensively metabolized after oral administration by a number of pathways, including CYP2D6 and CYP3A4, as well as by conjugation of parent and metabolites. Approximately 30% of the dose is excreted in the urine as unchanged drug, whereas 60% of the dose is excreted as metabolites. The remainder is excreted either as unidentified or as unextractable metabolites. The major metabolic pathways appear to be N- and O-demethylation and glucuronidation or sulfation in the liver. One metabolite (O-desmethyltramadol, denoted M1) is pharmacologically active in animal models. Formation of M1 is dependent on CYP2D6 and as such is subject to inhibition, which may affect the therapeutic response (see PRECAUTIONS; Drug Interactions). Approximately 7% of the population has reduced activity of the CYP2D6 isoenzyme of cytochrome P-450. These individuals are “poor metabolizers” of debrisoquine, dextromethorphan, tricyclic antidepressants, among other drugs. Based on a population PK analysis of Phase I studies in healthy subjects, concentrations of tramadol were approximately 20% higher in “poor metabolizers” versus “extensive metabolizers”, while M1 concentrations were 40% lower. Concomitant therapy with inhibitors of CYP2D6 such as fluoxetine, paroxetine and quinidine could result in significant drug interactions. 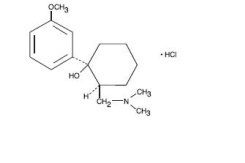 In vitro drug interaction studies in human liver microsomes indicate that inhibitors of CYP2D6 such as fluoxetine and its metabolite norfluoxetine, amitriptyline and quinidine inhibit the metabolism of tramadol to various degrees, suggesting that concomitant administration of these compounds could result in increases in tramadol concentrations and decreased concentrations of M1. The full pharmacological impact of these alterations in terms of either efficacy or safety is unknown. Concomitant use of SEROTONIN re-uptake INHIBITORS and MAO INHIBITORS may enhance the risk of adverse events, including seizure and serotonin syndrome (see WARNINGS). Excretion Tramadol metabolites are eliminated primarily by the kidneys. Metabolism of tramadol and M1 is reduced in patients with advanced cirrhosis of the liver, resulting in both a larger area under the concentration time curve for tramadol and longer tramadol and M1 elimination half-lives (13 hrs. for tramadol and 19 hrs. for M1). In cirrhotic patients, adjustment of the dosing regimen is recommended (see DOSAGE AND ADMINISTRATION). Impaired renal function results in a decreased rate and extent of excretion of tramadol and its active metabolite, M1. In patients with creatinine clearances of less than 30 mL/min, adjustment of the dosing regimen is recommended (see DOSAGE AND ADMINISTRATION). The total amount of tramadol and M1 removed during a 4-hour dialysis period is less than 7% of the administered dose. Healthy elderly subjects aged 65 to 75 years have plasma tramadol concentrations and elimination half-lives comparable to those observed in healthy subjects less than 65 years of age. In subjects over 75 years, maximum serum concentrations are elevated (208 vs. 162 ng/mL) and the elimination half-life is prolonged (7 vs. 6 hours) compared to subjects 65 to 75 years of age. Adjustment of the daily dose is recommended for patients older than 75 years (see DOSAGE AND ADMINISTRATION). The absolute bioavailability of tramadol was 73% in males and 79% in females. The plasma clearance was 6.4 mL/min/kg in males and 5.7 mL/min/kg in females following a 100 mg IV dose of tramadol. Following a single oral dose, and after adjusting for body weight, females had a 12% higher peak tramadol concentration and a 35% higher area under the concentration-time curve compared to males. The clinical significance of this difference is unknown. The formation of the active metabolite, M1, is mediated by CYP2D6, a polymorphic enzyme. Approximately 7% of the population has reduced activity of the CYP2D6 isoenzyme of cytochrome P450 metabolizing enzyme system. These individuals are “poor metabolizers” of debrisoquine, dextromethorphan and tricyclic antidepressants, among other drugs. Based on a population PK analysis of Phase 1 studies with IR tablets in healthy subjects, concentrations of tramadol were approximately 20% higher in “poor metabolizers” versus “extensive metabolizers,” while M1 concentrations were 40% lower. Potential for Tramadol to Affect Other DrugsIn vitro studies indicate that tramadol is unlikely to inhibit the CYP3A4-mediated metabolism of other drugs when tramadol is administered concomitantly at therapeutic doses. 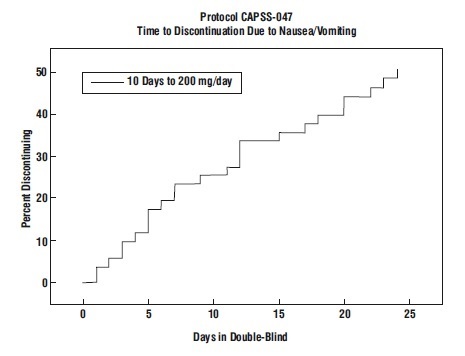 Tramadol does not appear to induce its own metabolism in humans, since observed maximal plasma concentrations after multiple oral doses are higher than expected based on single-dose data.CYP2D6 InhibitorsIn vitro drug interaction studies in human liver microsomes indicate that concomitant administration with inhibitors of CYP2D6 such as fluoxetine, paroxetine, and amitriptyline could result in some inhibition of the metabolism of tramadol (see PRECAUTIONS; Drug Interactions).QuinidineTramadol is metabolized to active metabolite M1 by CYP2D6. Coadministration of quinidine, a selective inhibitor of CYP2D6, with tramadol extended-release tablets resulted in a 50-60% increase in tramadol exposure and a 50-60% decrease in M1 exposure. The clinical consequences of these findings are unknown.To evaluate the effect of tramadol, a CYP2D6 substrate on quinidine, an in vitro drug interaction study in human liver microsomes was conducted. The results from this study indicate that tramadol has no effect on quinidine metabolism (see WARNINGS, PRECAUTIONS; Drug Interactions).CYP3A4 Inhibitors and InducersSince tramadol is also metabolized by CYP3A4, administration of CYP3A4 inhibitors, such as ketoconazole and erythromycin, or CYP3A4 inducers, such as rifampin and St. John's Wort, with tramadol hydrochloride tablets may affect the metabolism of tramadol leading to altered tramadol exposure (see WARNINGS, PRECAUTIONS;Drug Interactions).CimetidineConcomitant administration of tramadol IR tablets with cimetidine, a weak CYP3A4 inhibitor, does not result in clinically significant changes in tramadol pharmacokinetics. No alteration of the tramadol hydrochloride tablets dosage regimen with cimetidine is recommended.CarbamazepineCarbamazepine, a CYP3A4 inducer, increases tramadol metabolism. Patients taking carbamazepine may have a significantly reduced analgesic effect of tramadol. Concomitant administration of tramadol hydrochloride tablets and carbamazepine is not recommended. Tramadol hydrochloride tablets has been given in single oral doses of 50, 75 and 100 mg to patients with pain following surgical procedures and pain following oral surgery (extraction of impacted molars).In single-dose models of pain following oral surgery, pain relief was demonstrated in some patients at doses of 50 mg and 75 mg. A dose of 100 mg tramadol hydrochloride tablets tended to provide analgesia superior to codeine sulfate 60 mg, but it was not as effective as the combination of aspirin 650 mg with codeine phosphate 60 mg.Tramadol hydrochloride tablets have been studied in three long-term controlled trials involving a total of 820 patients, with 530 patients receiving tramadol hydrochloride tablets. Patients with a variety of chronic painful conditions were studied in double-blind trials of one to three months duration. Average daily doses of approximately 250 mg of tramadol hydrochloride tablets in divided doses were generally comparable to five doses of acetaminophen 300 mg with codeine phosphate 30 mg (TYLENOL with Codeine #3) daily, five doses of aspirin 325 mg with codeine phosphate 30 mg daily, or two to three doses of acetaminophen 500 mg with oxycodone hydrochloride 5 mg (TYLOX) daily. Tramadol hydrochloride tablets are indicated for the management of pain in adults that is severe enough to require an opioid analgesic and for which alternative treatments are inadequate.Limitations of UseBecause of the risks of addiction, abuse, and misuse with opioids, even at recommended doses (see WARNINGS), reserve tramadol hydrochloride tablets for use in patients for whom alternative treatment options [e.g., non-opioid analgesics]: •Have not been tolerated, or are not expected to be tolerated. •Have not provided adequate analgesia, or are not expected to provide adequate analgesia. Tramadol hydrochloride tablets are contraindicated for: •all children younger than 12 years of age (see WARNINGS) •post-operative management in children younger than 18 years of age following tonsillectomy and/or adenoidectomy (see WARNINGS).Tramadol hydrochloride tablets are also contraindicated in patients with: •Significant respiratory depression (see WARNINGS). •Acute or severe bronchial asthma in an unmonitored setting or in the absence of resuscitative equipment (see WARNINGS). •Known or suspected gastrointestinal obstruction, including paralytic ileus (see WARNINGS). •Hypersensitivity to tramadol, any other component of this product or opioids (see WARNINGS). •Concurrent use of monoamine oxidase inhibitors (MAOIs) or use of MAOIs within the last 14 days (see PRECAUTIONS; Drug Interactions). Tramadol hydrochloride tablets contain tramadol, a Schedule IV controlled substance. As an opioid, tramadol hydrochloride tablets expose users to the risks of addiction, abuse, and misuse (see DRUG ABUSE AND DEPENDENCE).Although the risk of addiction in any individual is unknown, it can occur in patients appropriately prescribed tramadol hydrochloride tablets. Addiction can occur at recommended dosages and if the drug is misused or abused.Assess each patient's risk for opioid addiction, abuse, or misuse prior to prescribing tramadol hydrochloride tablets, and monitor all patients receiving tramadol hydrochloride tablets for the development of these behaviors and conditions. Risks are increased in patients with a personal or family history of substance abuse (including drug or alcohol abuse or addiction) or mental illness (e.g., major depression). The potential for these risks should not, however, prevent the proper management of pain in any given patient. Patients at increased risk may be prescribed opioids such as tramadol hydrochloride tablets, but use in such patients necessitates intensive counseling about the risks and proper use of tramadol hydrochloride tablets along with intensive monitoring for signs of addiction, abuse, and misuse.Opioids are sought by drug abusers and people with addiction disorders and are subject to criminal diversion. Consider these risks when prescribing or dispensing tramadol hydrochloride tablets. Strategies to reduce these risks include prescribing the drug in the smallest appropriate quantity and advising the patient on the proper disposal of unused drug (see PRECAUTIONS; Information for Patients). Contact local state professional licensing board or state controlled substances authority for information on how to prevent and detect abuse or diversion of this product. To ensure that the benefits of opioid analgesics outweigh the risks of addiction, abuse, and misuse, the Food and Drug Administration (FDA) has required a Risk Evaluation and Mitigation Strategy (REMS) for these products. Under the requirements of the REMS, drug companies with approved opioid analgesic products must make REMS-compliant education programs available to healthcare providers. Healthcare providers are strongly encouraged to do all of the following: •Complete a REMS-compliant education program offered by an accredited provider of continuing education (CE) or another education program that includes all the elements of the FDA Education Blueprint for Health Care Providers Involved in the Management or Support of Patients with Pain. •Discuss the safe use, serious risks, and proper storage and disposal of opioid analgesics with patients and/or their caregivers every time these medicines are prescribed. The Patient Counseling Guide (PCG) can be obtained at this link: www.fda.gov/OpioidAnalgesicREMSPCG. •Emphasize to patients and their caregivers the importance of reading the Medication Guide that they will receive from their pharmacist every time an opioid analgesic is dispensed to them. •Consider using other tools to improve patient, household, and community safety, such as patient-prescriber agreements that reinforce patient-prescriber responsibilities.To obtain further information on the opioid analgesic REMS and for a list of accredited REMS CME/CE, call 1-800-503-0784, or log on to www.opioidanalgesicrems.com. The FDA Blueprint can be found at www.fda.gov/OpioidAnalgesicREMSBlueprint. Serious, life-threatening, or fatal respiratory depression has been reported with the use of opioids, even when used as recommended. Respiratory depression, if not immediately recognized and treated, may lead to respiratory arrest and death. Management of respiratory depression may include close observation, supportive measures, and use of opioid antagonists, depending on the patient's clinical status (see OVERDOSAGE). Carbon dioxide (CO2 ) retention from opioid-induced respiratory depression can exacerbate the sedating effects of opioids.While serious, life-threatening, or fatal respiratory depression can occur at any time during the use of tramadol hydrochloride tablets, the risk is greatest during the initiation of therapy or following a dosage increase. Monitor patients closely for respiratory depression, especially within the first 24-72 hours of initiating therapy with and following dosage increases of tramadol hydrochloride tablets.To reduce the risk of respiratory depression, proper dosing and titration of tramadol hydrochloride tablets are essential (see DOSAGE AND ADMINISTRATION). Overestimating the tramadol hydrochloride tablets dosage when converting patients from another opioid product can result in a fatal overdose with the first dose.Accidental ingestion of even one dose of tramadol hydrochloride tablets, especially by children, can result in respiratory depression and death due to an overdose of tramadol. Life-threatening respiratory depression and death have occurred in children who received tramadol. Tramadol and codeine are subject to variability in metabolism based upon CYP2D6 genotype (described below), which can lead to increased exposure to an active metabolite. Based upon post-marketing reports with tramadol or with codeine, children younger than 12 years of age may be more susceptible to the respiratory depressant effects of tramadol. Furthermore, children with obstructive sleep apnea who are treated with opioids for post-tonsillectomy and/or adenoidectomy pain may be particularly sensitive to their respiratory depressant effect. Because of the risk of life-threatening respiratory depression and death: •Tramadol hydrochloride tablets are contraindicated for all children younger than 12 years of age (see CONTRAINDICATIONS). •Tramadol hydrochloride tablets are contraindicated for post-operative management in pediatric patients younger than 18 years of age following tonsillectomy and/or adenoidectomy (see CONTRAINDICATIONS). •Avoid the use of tramadol hydrochloride tablets in adolescents 12 to 18 years of age who have other risk factors that may increase their sensitivity to the respiratory depressant effects of tramadol unless the benefits outweigh the risks. Risk factors include conditions associated with hypoventilation such as postoperative status, obstructive sleep apnea, obesity, severe pulmonary disease, neuromuscular disease, and concomitant use of other medications that cause respiratory depression. •As with adults, when prescribing opioids for adolescents, healthcare providers should choose the lowest effective dose for the shortest period of time and inform patients and caregivers about these risks and the signs of opioid overdose (see PRECAUTIONS/Pediatric Use, OVERDOSAGE).Nursing MothersTramadol is subject to the same polymorphic metabolism as codeine, with ultra-rapid metabolizers of CYP2D6 substrates being potentially exposed to life-threatening levels of the active metabolite O-desmethyltramadol (M1). At least one death was reported in a nursing infant who was exposed to high levels of morphine in breast milk because the mother was an ultra-rapid metabolizer of codeine. A baby nursing from an ultra-rapid metabolizer mother taking tramadol hydrochloride tablets could potentially be exposed to high levels of M1, and experience life-threatening respiratory depression. For this reason, breastfeeding is not recommended during treatment with tramadol hydrochloride tablets (see PRECAUTIONS/Nursing Mothers).CYP2D6 Genetic Variability: Ultra-rapid metabolizerSome individuals may be ultra-rapid metabolizers because of a specific CYP2D6 genotype (e.g., gene duplications denoted as *1/*1xN or *1/*2xN). The prevalence of this CYP2D6 phenotype varies widely and has been estimated at 1 to 10% for Whites (European, North American), 3 to 4% for Blacks (African Americans), 1 to 2% for East Asians (Chinese, Japanese, Korean), and may be greater than 10% in certain racial/ethnic groups (i.e., Oceanian, Northern African, Middle Eastern, Ashkenazi Jews, Puerto Rican). These individuals convert tramadol into its active metabolite, O-desmethyltramadol (M1), more rapidly and completely than other people. This rapid conversion results in higher than expected serum M1 levels. Even at labeled dosage regimens, individuals who are ultra-rapid metabolizers may have life-threatening or fatal respiratory depression or experience signs of overdose (such as extreme sleepiness, confusion, or shallow breathing) (see OVERDOSAGE). Therefore, individuals who are ultra-rapid metabolizers should not use tramadol hydrochloride tablets. Prolonged use of tramadol hydrochloride tablets during pregnancy can result in withdrawal in the neonate. Neonatal opioid withdrawal syndrome, unlike opioid withdrawal syndrome in adults, may be life-threatening if not recognized and treated, and requires management according to protocols developed by neonatology experts. Observe newborns for signs of neonatal opioid withdrawal syndrome and manage accordingly. Advise pregnant women using opioids for a prolonged period of the risk of neonatal opioid withdrawal syndrome and ensure that appropriate treatment will be available (see PRECAUTIONS; Information for Patients, Pregnancy). The effects of concomitant use or discontinuation of cytochrome P450 3A4 inducers, 3A4 inhibitors, or 2D6 inhibitors on levels of tramadol and M1 from tramadol hydrochloride tablets are complex. Use of cytochrome P450 3A4 inducers, 3A4 inhibitors, or 2D6 inhibitors with tramadol hydrochloride tablets requires careful consideration of the effects on the parent drug, tramadol which is a weak serotonin and norepinephrine reuptake inhibitor and μ-opioid agonist, and the active metabolite, M1, which is more potent than tramadol in μ-opioid receptor binding (see PRECAUTIONS; Drug Interactions).Risks of Concomitant Use or Discontinuation of Cytochrome P450 2D6 InhibitorsThe concomitant use of tramadol hydrochloride tablets with all cytochrome P450 2D6 inhibitors (e.g., amiodarone, quinidine) may result in an increase in tramadol plasma levels and a decrease in the levels of the active metabolite, M1. A decrease in M1 exposure in patients who have developed physical dependence to tramadol, may result in signs and symptoms of opioid withdrawal and reduced efficacy. The effect of increased tramadol levels may be an increased risk for serious adverse events including seizures and serotonin syndrome.Discontinuation of a concomitantly used cytochrome P450 2D6 inhibitor may result in a decrease in tramadol plasma levels and an increase in active metabolite M1 levels, which could increase or prolong adverse reactions related to opioid toxicity and may cause potentially fatal respiratory depression.Follow patients receiving tramadol hydrochloride tablets and any CYP2D6 inhibitor for the risk of serious adverse events including seizures and serotonin syndrome, signs and symptoms that may reflect opioid toxicity, and opioid withdrawal when tramadol hydrochloride tablets are used in conjunction with inhibitors of CYP2D6 (see PRECAUTIONS; Drug Interactions).Cytochrome P450 3A4 InteractionThe concomitant use of tramadol hydrochloride tablets with cytochrome P450 3A4 inhibitors, such as macrolide antibiotics (e.g., erythromycin), azole-antifungal agents (e.g., ketoconazole), and protease inhibitors (e.g., ritonavir) or discontinuation of a cytochrome P450 3A4 inducer such as rifampin, carbamazepine, and phenytoin, may result in an increase in tramadol plasma concentrations, which could increase or prolong adverse reactions, increase the risk for serious adverse events including seizures and serotonin syndrome, and may cause potentially fatal respiratory depression.The concomitant use of tramadol hydrochloride tablets with all cytochrome P450 3A4 inducers or discontinuation of a cytochrome P450 3A4 inhibitor may result in lower tramadol levels. This may be associated with a decrease in efficacy, and in some patients, may result in signs and symptoms of opioid withdrawal.Follow patients receiving tramadol hydrochloride tablets and any CYP3A4 inhibitor or inducer for the risk for serious adverse events including seizures and serotonin syndrome, signs and symptoms that may reflect opioid toxicity and opioid withdrawal when tramadol hydrochloride tablets are used in conjunction with inhibitors and inducers of CYP3A4 (see PRECAUTIONS; Drug Interactions). Profound sedation, respiratory depression, coma, and death may result from the concomitant use of tramadol hydrochloride tablets with benzodiazepines or other CNS depressants (e.g., non-benzodiazepine sedatives/hypnotics, anxiolytics, tranquilizers, muscle relaxants, general anesthetics, antipsychotics, other opioids, alcohol). Because of these risks, reserve concomitant prescribing of these drugs for use in patients for whom alternative treatment options are inadequate.Observational studies have demonstrated that concomitant use of opioid analgesics and benzodiazepines increases the risk of drug-related mortality compared to use of opioid analgesics alone. Because of similar pharmacological properties, it is reasonable to expect similar risk with the concomitant use of other CNS depressant drugs with opioid analgesics (see PRECAUTIONS; Drug Interactions).If the decision is made to prescribe a benzodiazepine or other CNS depressant concomitantly with an opioid analgesic, prescribe the lowest effective dosages and minimum durations of concomitant use. In patients already receiving an opioid analgesic, prescribe a lower initial dose of the benzodiazepine or other CNS depressant than indicated in the absence of an opioid, and titrate based on clinical response. If an opioid analgesic is initiated in a patient already taking a benzodiazepine or other CNS depressant, prescribe a lower initial dose of the opioid analgesic, and titrate based on clinical response. Follow patients closely for signs and symptoms of respiratory depression and sedation.Advise both patients and caregivers about the risks of respiratory depression and sedation when tramadol hydrochloride tablets are used with benzodiazepines or other CNS depressants (including alcohol and illicit drugs). Advise patients not to drive or operate heavy machinery until the effects of concomitant use of the benzodiazepine or other CNS depressant have been determined. Screen patients for risk of substance use disorders, including opioid abuse and misuse, and warn them of the risk for overdose and death associated with the use of additional CNS depressants including alcohol and illicit drugs (see PRECAUTIONS; Drug Interactions, Information for Patients/Caregivers). Cases of serotonin syndrome, a potentially life-threatening condition, have been reported with the use of tramadol, particularly during concomitant use with serotonergic drugs. Serotonergic drugs include selective serotonin reuptake inhibitors (SSRIs), serotonin and norepinephrine reuptake inhibitors (SNRIs), tricyclic antidepressants (TCAs), triptans, 5- HT3 receptor antagonists, drugs that affect the serotonergic neurotransmitter system (e.g., mirtazapine, trazodone, tramadol), and drugs that impair metabolism of serotonin (including MAO inhibitors, both those intended to treat psychiatric disorders and also others, such as linezolid and intravenous methylene blue) (see PRECAUTIONS; Drug Interactions). This may occur within the recommended dosage range.Serotonin syndrome symptoms may include mental status changes (e.g., agitation, hallucinations, coma), autonomic instability (e.g., tachycardia, labile blood pressure, hyperthermia), neuromuscular aberrations (e.g., hyperreflexia, incoordination, rigidity), and/or gastrointestinal symptoms (e.g., nausea, vomiting, diarrhea). The onset of symptoms generally occurs within several hours to a few days of concomitant use, but may occur later than that. Discontinue tramadol hydrochloride tablets if serotonin syndrome is suspected. Seizures have been reported in patients receiving tramadol hydrochloride tablets within the recommended dosage range.Spontaneous post-marketing reports indicate that seizure risk is increased with doses of tramadol hydrochloride tablets above the recommended range. Concomitant use of tramadol hydrochloride tablets increases the seizure risk in patients taking: •Selective serotonin re-uptake inhibitors (SSRI antidepressants or anorectics), •Tricyclic antidepressants (TCAs), and other tricyclic compounds (e.g., cyclobenzaprine, promethazine, etc. ), or •Other opioids, •MAO inhibitors (see also WARNINGS, Serotonin Syndrome Risk), •Neuroleptics, or •Other drugs that reduce the seizure threshold. Risk of seizure may also increase in patients with epilepsy, those with a history of seizures, or in patients with a recognized risk for seizure (such as head trauma, metabolic disorders, alcohol and drug withdrawal, CNS infections). In tramadol hydrochloride tablets overdose, naloxone administration may increase the risk of seizure. •Do not prescribe tramadol hydrochloride tablets for patients who are suicidal or addiction-prone. Consideration should be given to the use of non-narcotic analgesics in patients who are suicidal or depressed. (see DRUG ABUSE AND DEPENDENCE). •Prescribe tramadol hydrochloride tablets with caution for patients with a history of misuse and/or are currently taking CNS-active drugs including tranquilizers or antidepressant drugs, alcohol in excess, and patients who suffer from emotional disturbance or depression (see PRECAUTIONS; Drug Interactions). •Inform patients not to exceed the recommended dose and to limit their intake of alcohol (see DOSAGE AND ADMINISTRATION). Cases of adrenal insufficiency have been reported with opioid use, more often following greater than one month of use. Presentation of adrenal insufficiency may include non-specific symptoms and signs including nausea, vomiting, anorexia, fatigue, weakness, dizziness, and low blood pressure. If adrenal insufficiency is suspected, confirm the diagnosis with diagnostic testing as soon as possible. If adrenal insufficiency is diagnosed, treat with physiologic replacement doses of corticosteroids. Wean the patient off of the opioid to allow adrenal function to recover and continue corticosteroid treatment until adrenal function recovers. Other opioids may be tried as some cases reported use of a different opioid without recurrence of adrenal insufficiency. The information available does not identify any particular opioids as being more likely to be associated with adrenal insufficiency. The use of tramadol hydrochloride tablets in patients with acute or severe bronchial asthma in an unmonitored setting or in the absence of resuscitative equipment is contraindicated.Patients with Chronic Pulmonary Disease: Tramadol hydrochloride tablets-treated patients with significant chronic obstructive pulmonary disease or cor pulmonale, and those with a substantially decreased respiratory reserve, hypoxia, hypercapnia, or pre-existing respiratory depression are at increased risk of decreased respiratory drive including apnea, even at recommended dosages of tramadol hydrochloride tablets (see WARNINGS).Elderly, Cachectic, or Debilitated Patients: Life-threatening respiratory depression is more likely to occur in elderly, cachectic, or debilitated patients because they may have altered pharmacokinetics or altered clearance compared to younger, healthier patients (see WARNINGS).Monitor such patients closely, particularly when initiating and titrating tramadol hydrochloride tablets and when tramadol hydrochloride tablets are given concomitantly with other drugs that depress respiration (see WARNINGS). Alternatively, consider the use of non-opioid analgesics in these patients. Tramadol hydrochloride tablets may cause severe hypotension including orthostatic hypotension and syncope in ambulatory patients. There is increased risk in patients whose ability to maintain blood pressure has already been compromised by a reduced blood volume or concurrent administration of certain CNS depressant drugs (e.g. phenothiazines or general anesthetics) (see PRECAUTIONS; Drug Interactions). Monitor these patients for signs of hypotension after initiating or titrating the dosage of tramadol hydrochloride tablets. In patients with circulatory shock, tramadol hydrochloride tablets may cause vasodilation that can further reduce cardiac output and blood pressure. Avoid the use of tramadol hydrochloride tablets in patients with circulatory shock. In patients who may be susceptible to the intracranial effects of CO2 retention (e.g., those with evidence of increased intracranial pressure or brain tumors), tramadol hydrochloride tablets may reduce respiratory drive, and the resultant CO2 retention can further increase intracranial pressure. Monitor such patients for signs of sedation and respiratory depression, particularly when initiating therapy with tramadol hydrochloride tablets.Opioids may also obscure the clinical course in a patient with a head injury. Avoid the use of tramadol hydrochloride tablets in patients with impaired consciousness or coma. Tramadol hydrochloride tablets are contraindicated in patients with known or suspected gastrointestinal obstruction, including paralytic ileus (see CONTRAINDICATIONS).The tramadol in tramadol hydrochloride tablets may cause spasm of the sphincter of Oddi. Opioids may cause increases in serum amylase. Monitor patients with biliary tract disease, including acute pancreatitis for worsening symptoms. Avoid the use of mixed agonist/antagonist (e.g, pentazocine, nalbuphine, and butorphanol) or partial agonist (e.g., buprenorphine) analgesics in patients who are receiving a full opioid agonist analgesic, including tramadol hydrochloride tablets. In these patients, mixed agonist/antagonist and partial agonist analgesics may reduce the analgesic effect and/or precipitate withdrawal symptoms.When discontinuing tramadol hydrochloride tablets in a physically-dependent patient, gradually taper the dosage (see DOSAGE AND ADMINISTRATION). Do not abruptly discontinue tramadol hydrochloride tablets in these patients (see DRUG ABUSE AND DEPENDENCE). Tramadol hydrochloride tablets may impair the mental or physical abilities needed to perform potentially hazardous activities such as driving a car or operating machinery. Warn patients not to drive or operate dangerous machinery unless they are tolerant to the effects of tramadol hydrochloride tablets and know how they will react to the medication. Impaired renal function results in a decreased rate and extent of excretion of tramadol and its active metabolite, M1. In patients with creatinine clearances of less than 30 mL/min, dosing reduction is recommended (see DOSAGE AND ADMINISTRATION). Metabolism of tramadol and M1 is reduced in patients with advanced cirrhosis of the liver. In cirrhotic patients, dosing reduction is recommended (see DOSAGE AND ADMINISTRATION).With the prolonged half-life in these conditions, achievement of steady-state is delayed, so that it may take several days for elevated plasma concentrations to develop. Advise the patient to read the FDA-approved patient labeling (Medication Guide).Addiction, Abuse, and MisuseInform patients that the use of tramadol hydrochloride tablets, even when taken as recommended, can result in addiction, abuse, and misuse, which can lead to overdose and death (see WARNINGS). Instruct patients not to share tramadol hydrochloride tablets with others and to take steps to protect tramadol hydrochloride tablets from theft or misuse.Life-Threatening Respiratory DepressionInform patients of the risk of life-threatening respiratory depression, including information that the risk is greatest when starting tramadol hydrochloride tablets or when the dosage is increased, and that it can occur even at recommended dosages (see WARNINGS). Advise patients how to recognize respiratory depression and to seek medical attention if breathing difficulties develop.Accidental IngestionInform patients that accidental ingestion, especially by children, may result in respiratory depression or death (see WARNINGS). Instruct patients to take steps to store tramadol hydrochloride tablets securely and to dispose of unused tramadol hydrochloride tablets in accordance with the local state guidelines and/or regulations.Ultra-Rapid Metabolism of Tramadol and Other Risk Factors for Life-threatening Respiratory Depression in ChildrenAdvise caregivers that tramadol hydrochloride tablets are contraindicated in children younger than 12 years of age and in children younger than 18 years of age following tonsillectomy and/or adenoidectomy. Advise caregivers of children ages 12 to 18 years of age receiving tramadol hydrochloride tablets to monitor for signs of respiratory depression (see WARNINGS).Interactions with Benzodiazepines and Other CNS DepressantsInform patients and caregivers that potentially fatal additive effects may occur if tramadol hydrochloride tablets are used with benzodiazepines, CNS depressants, including alcohol, or some illicit drugs and not to use these concomitantly unless supervised by a healthcare provider (see WARNINGS, PRECAUTIONS; Drug Interactions).Serotonin SyndromeInform patients that opioids could cause a rare but potentially life-threatening condition resulting from concomitant administration of serotonergic drugs. Warn patients of the symptoms of serotonin syndrome, and to seek medical attention right away if symptoms develop. Instruct patients to inform their healthcare provider if they are taking, or plan to take serotonergic medications (see WARNINGS).MAOI InteractionInform patients not to take tramadol hydrochloride tablets while using any drugs that inhibit monoamine oxidase. Patients should not start MAOIs while taking tramadol hydrochloride tablets (see PRECAUTIONS: Drug Interactions).SeizuresInform patients that tramadol hydrochloride tablets may cause seizures with concomitant use of serotonergic agents (including SSRIs, SNRIs, and triptans) or drugs that significantly reduce the metabolic clearance of tramadol (see WARNINGS).Adrenal InsufficiencyInform patients that opioids could cause adrenal insufficiency, a potentially life- threatening condition. Adrenal insufficiency may present with non-specific symptoms and signs such as nausea, vomiting, anorexia, fatigue, weakness, dizziness, and low blood pressure. Advise patients to seek medical attention if they experience a constellation of these symptoms (see WARNINGS).Important Administration InstructionsInstruct patients how to properly take tramadol hydrochloride tablets. (see DOSAGE AND ADMINISTRATION, WARNINGS) •Advise patients not to adjust the dose of tramadol hydrochloride tablets without consulting with a physician or other healthcare professional. •If patients have been receiving treatment with tramadol hydrochloride tablets for more than a few weeks and cessation of therapy is indicated, counsel them on the importance of safely tapering the dose as abrupt discontinuation of the medication could precipitate withdrawal symptoms. Provide a dose schedule to accomplish a gradual discontinuation of the medication (see DOSAGE AND ADMINISTRATION).HypotensionInform patients that tramadol hydrochloride tablets may cause orthostatic hypotension and syncope. Instruct patients how to recognize symptoms of low blood pressure and how to reduce the risk of serious consequences should hypotension occur (e.g., sit or lie down, carefully rise from a sitting or lying position) (see WARNINGS).AnaphylaxisInform patients that anaphylaxis has been reported with ingredients contained in tramadol hydrochloride tablets. Advise patients how to recognize such a reaction and when to seek medical attention (see CONTRAINDICATIONS, ADVERSE REACTIONS).PregnancyNeonatal Opioid Withdrawal SyndromeInform female patients of reproductive potential that prolonged use of tramadol hydrochloride tablets during pregnancy can result in neonatal opioid withdrawal syndrome, which may be life-threatening if not recognized and treated and that the patient should inform their healthcare provider if they have used opioids at any time during their pregnancy, especially near the time of birth. (see WARNINGS, PRECAUTIONS; Labor or Delivery).Embryo-Fetal ToxicityInform female patients of reproductive potential that tramadol hydrochloride tablets may cause fetal harm and to inform the healthcare provider of a known or suspected pregnancy (see PRECAUTONS; Pregnancy).LactationAdvise women that breastfeeding is not recommended during treatment with tramadol hydrochloride tablets (see PRECAUTIONS; Nursing Mothers).Infertility Inform patients that chronic use of opioids may cause reduced fertility. It is not known whether these effects on fertility are reversible (see PRECAUTIONS).Driving or Operating Heavy MachineryInform patients that tramadol hydrochloride tablets may impair the ability to perform potentially hazardous activities such as driving a car or operating heavy machinery. Advise patients not to perform such tasks until they know how they will react to the medication (see WARNINGS).ConstipationAdvise patients of the potential for severe constipation, including management instructions and when to seek medical attention (see ADVERSE REACTIONS).Disposal of Unused Tramadol Hydrochloride TabletsAdvise patients to throw the unused tramadol hydrochloride tablets in the household trash following these steps. 1) Remove the drugs from their original containers and mix with an undesirable substance, such as used coffee grounds or kitty litter (this makes the drug less appealing to children and pets, and unrecognizable to people who may intentionally go through the trash seeking drugs). 2) Place the mixture in a sealable bag, empty can, or other container to prevent the drug from leaking or breaking out of a garbage bag.Maximum single-dose and 24-hour doseAdvise patients not to exceed the single-dose and 24-hour dose limit and the time interval between doses, since exceeding these recommendations can result in respiratory depression, seizures and death (see DOSAGE AND ADMINISTRATION; WARNINGS). The concomitant use of tramadol hydrochloride tablets and CYP2D6 inhibitors, such as quinidine, fluoxetine, paroxetine and bupropion, may result in an increase in the plasma concentration of tramadol and a decrease in the plasma concentration of M1, particularly when an inhibitor is added after a stable dose of tramadol hydrochloride tablets is achieved. Since M1 is a more potent μ-opioid agonist, decreased M1 exposure could result in decreased therapeutic effects, and may result in signs and symptoms of opioid withdrawal in patients who had developed physical dependence to tramadol. Increased tramadol exposure can result in increased or prolonged therapeutic effects and increased risk for serious adverse events including seizures and serotonin syndrome.After stopping a CYP2D6 inhibitor, as the effects of the inhibitor decline, the tramadol plasma concentration will decrease and the M1 plasma concentration will increase which could increase or prolong therapeutic effects but also increase adverse reactions related to opioid toxicity, and may cause potentially fatal respiratory depression (see CLINICAL PHARMACOLOGY).If concomitant use of a CYP2D6 inhibitor is necessary, follow patients closely for adverse reactions including opioid withdrawal, seizures, and serotonin syndrome.If a CYP2D6 inhibitor is discontinued, consider lowering tramadol hydrochloride tablets dosage until stable drug effects are achieved. Follow patients closely for adverse events including respiratory depression and sedation. Quinidine is a selective inhibitor of CYP2D6, so that concomitant administration of quinidine and tramadol hydrochloride tablets results in increased concentrations of tramadol and reduced concentrations of M1. The clinical consequences of these findings are unknown. The concomitant use of tramadol hydrochloride tablets and CYP3A4 inhibitors, such as macrolide antibiotics (e.g., erythromycin), azole-antifungal agents (e.g. ketoconazole), protease inhibitors (e.g., ritonavir), can increase the plasma concentration of tramadol, and may result in a greater amount of metabolism via CYP2D6 and greater levels of M1. Follow patients closely for increased risk of serious adverse events including seizures and serotonin syndrome, and adverse reactions related to opioid toxicity including potentially fatal respiratory depression, particularly when a CYP3A4 inhibitor is added after a stable dose of tramadol hydrochloride tablets is achieved.After stopping a CYP3A4 inhibitor, as the effects of the inhibitor decline, the tramadol plasma concentration will decrease (see CLINICAL PHARMACOLOGY), resulting in decreased opioid efficacy or a withdrawal syndrome in patients who had developed physical dependence to tramadol.If concomitant use is necessary, consider dosage reduction of tramadol hydrochloride tablets until stable drug effects are achieved. Follow patients closely for seizures and serotonin syndrome, and signs of respiratory depression and sedation at frequent intervals. If a CYP3A4 inhibitor is discontinued, consider increasing the tramadol hydrochloride tablets dosage until stable drug effects are achieved and follow patients for signs and symptoms of opioid withdrawal. The concomitant use of tramadol hydrochloride tablets and CYP3A4 inducers, such as rifampin, carbamazepine and phenytoin, can decrease the plasma concentration of tramadol resulting in decreased efficacy or onset of a withdrawal syndrome in patients who have developed physical dependence to tramadol (see WARNINGS).After stopping a CYP3A4 inducer, as the effects of the inducer decline, the tramadol plasma concentration will increase, which could increase or prolong both the therapeutic effects and adverse reactions, and may cause seizures and serotonin syndrome, and potentially fatal respiratory depression. Patients taking carbamazepine, a CYP3A4 inducer, may have a significantly reduced analgesic effect of tramadol. Because carbamazepine increases tramadol metabolism and because of the seizure risk associated with tramadol, concomitant administration of tramadol hydrochloride tablets and carbamazepine is not recommended. Due to additive pharmacologic effects, the concomitant use of benzodiazepines or other CNS depressants, including alcohol, increases the risk of respiratory depression, profound sedation, coma, and death. Examples of other CNS depressants include other sedatives/hypnotics, anxiolytics, tranquilizers, muscle relaxants, general anesthetics, antipsychotics, other opioids, and some illicit drugs.Reserve concomitant prescribing of these drugs for use in patients for whom alternative treatment options are inadequate. Limit the treatment to the minimum effective dosages and durations. Follow patients closely for signs of respiratory depression and sedation (see WARNINGS). The concomitant use of opioids with other drugs that affect the serotonergic neurotransmitter system has resulted in serotonin syndrome. Examples of these drugs include, selective serotonin reuptake inhibitors (SSRIs), serotonin and norepinephrine reuptake inhibitors (SNRIs), tricyclic antidepressants (TCAs), triptans, 5-HT3 receptor antagonists, drugs that effect the serotonin neurotransmitter system (e.g., mirtazapine, trazodone), monoamine oxidase (MAO) inhibitors (used to treat psychiatric disorders and also others, such as linezolid and intravenous methylene blue).If concomitant use is warranted, carefully observe the patient, particularly during treatment initiation and dose adjustment. Discontinue tramadol hydrochloride tablets immediately if serotonin syndrome is suspected. Do not use tramadol hydrochloride tablets in patients taking MAOIs or within 14 days of stopping such treatment.MAOI interactions with opioids may manifest as serotonin syndrome (see WARNINGS) or opioid toxicity (e.g., respiratory depression, coma) (see WARNINGS). Examples of these drugs include, phenelzine, tranylcypromine, linezolid. Post-marketing surveillance has revealed rare reports of digoxin toxicity. Follow patients for signs of digoxin toxicity and adjust dosage of digoxin as needed. Post-marketing surveillance of tramadol has revealed rare reports of alteration of warfarin effect, including elevation of prothrombin times. Monitor the prothrombin time of patients on warfarin for signs of an interaction and adjust the dosage of warfarin as needed. Mixed agonist/antagonist and partial agonist opioid analgesics may reduce the analgesic effect of tramadol hydrochloride tablets and/or precipitate withdrawal symptoms. Examples of these drugs include butorphanol, nalbuphine, pentazocine and buprenorphine. Avoid concomitant use of these drugs. Tramadol may enhance the neuromuscular blocking action of skeletal muscle relaxants and produce an increased degree of respiratory depression. Monitor patients for signs of respiratory depression that may be greater than otherwise expected and decrease the dosage of tramadol hydrochloride tablets and/or the muscle relaxant as necessary. Opioids can reduce the efficacy of diuretics by inducing the release of antidiuretic hormone. Monitor patients for signs of diminished diuresis and/or effects on blood pressure and increase the dosage of the diuretic as needed. The concomitant use of anticholinergic drugs may increase risk of urinary retention and/or severe constipation, which may lead to paralytic ileus. Monitor patients for signs of urinary retention or reduced gastric motility when tramadol hydrochloride tablets are used concomitantly with anticholinergic drugs. CarcinogenesisA slight, but statistically significant, increase in two common murine tumors, pulmonary and hepatic, was observed in an NMRI mouse carcinogenicity study, particularly in aged mice. Mice were dosed orally up to 30 mg/kg in the drinking water (0.36 times the maximum recommended human daily dosage or MRHD) for approximately two years, although the study was not done with the Maximum Tolerated Dose. This finding is not believed to suggest risk in humans. No evidence of carcinogenicity was noted in a rat 2-year carcinogenicity study testing oral doses of up to 30 mg/kg in the drinking water, 0.73 times the MRHD).MutagenesisTramadol was mutagenic in the presence of metabolic activation in the mouse lymphoma assay. Tramadol was not mutagenic in the in vitro bacterial reverse mutation assay using Salmonella and E. coli (Ames), the mouse lymphoma assay in the absence of metabolic activation, the in vitro chromosomal aberration assay, or the in vivo micronucleus assay in bone marrow.Impairment of FertilityNo effects on fertility were observed for tramadol at oral dose levels up to 50 mg/kg in male rats and 75 mg/kg in female rats. These dosages are 1.2 and 1.8 times the maximum recommended human daily dose based on body surface area, respectively. Risk SummaryProlonged use of opioid analgesics during pregnancy may cause neonatal opioid withdrawal syndrome. Available data with tramadol hydrochloride tablets in pregnant women are insufficient to inform a drug-associated risk for major birth defects and miscarriage.In animal reproduction studies, tramadol administration during organogenesis decreased fetal weights and reduced ossification in mice, rats, and rabbits at 1.4, 0.6, and 3.6 times the maximum recommended human daily dosage (MRHD).Tramadol decreased pup body weight and increased pup mortality at 1.2 and 1.9 times the MRHD (see Data). Based on animal data, advise pregnant women of the potential risk to a fetus.The estimated background risk of major birth defects and miscarriage for the indicated population is unknown. All pregnancies have a background risk of birth defect, loss, or other adverse outcomes. In the U.S. general population, the estimated background risk of major birth defects and miscarriage in clinically recognized pregnancies is 2-4% and 15-20%, respectively.Clinical ConsiderationsNeonatal Adverse ReactionsProlonged use of opioid analgesics during pregnancy for medical or nonmedical purposes can result in respiratory depression and physical dependence in the neonate and neonatal opioid withdrawal syndrome shortly after birth.Neonatal opioid withdrawal syndrome can present as irritability, hyperactivity and abnormal sleep pattern, high pitched cry, tremor, vomiting, diarrhea and failure to gain weight. The onset, duration, and severity of neonatal opioid withdrawal syndrome vary based on the specific opioid used, duration of use, timing and amount of last maternal use, and rate of elimination of the drug by the newborn. Observe newborns for symptoms and signs of neonatal opioid withdrawal syndrome and manage accordingly (see WARNINGS).Neonatal seizures, neonatal withdrawal syndrome, fetal death and still birth have been reported during post-marketing. Tramadol hydrochloride tablets are not recommended for use in pregnant women during or immediately prior to labor, when other analgesic techniques are more appropriate. Opioids cross the placenta and may induce dependency of the fetus, acute respiratory depression in the newborn and/or psycho-physiologic effects associated with opioid exposure and withdrawal. An opioid antagonist, such as naloxone, must be available for reversal of opioid-induced respiratory depression in the neonate. Monitor newborns exposed to opioid analgesics during labor for signs of excess sedation and respiratory depression.Use of opioid analgesics, including tramadol hydrochloride tablets, may impact the duration of labor due to inhibitory actions on uterine contractions or facilitatory actions on cervical dilation.Tramadol has been shown to cross the placenta. The mean ratio of serum tramadol in the umbilical veins compared to maternal veins was 0.83 for 40 women given tramadol during labor.The effect of tramadol hydrochloride tablets, if any, on the later growth, development, and functional maturation of the child is unknown. Animal DataTramadol has been shown to be embryotoxic and fetotoxic in mice, (120 mg/kg), rats (25 mg/kg) and rabbits (75 mg/kg) at maternally toxic dosages, but was not teratogenic at these dose levels. These doses on a mg/m2 basis are 1.4, 0.6, and 3.6 times the maximum recommended human daily dosage (MRHD) for mouse, rat and rabbit, respectively.No drug-related teratogenic effects were observed in progeny of mice (up to 140 mg/kg), rats (up to 80 mg/kg) or rabbits (up to 300 mg/kg) treated with tramadol by various routes. Embryo and fetal toxicity consisted primarily of decreased fetal weights, decreased skeletal ossification and increased supernumerary ribs at maternally toxic dose levels. Transient delays in developmental or behavioral parameters were also seen in pups from rat dams allowed to deliver. Embryo and fetal lethality were reported only in one rabbit study at 300 mg/kg, a dose that would cause extreme maternal toxicity in the rabbit. The dosages listed for mouse, rat and rabbit are 1.7, 1.9 and 14.6 times the MRHD, respectively.Tramadol was evaluated in pre- and post-natal studies in rats. Progeny of dams receiving oral (gavage) dose levels of 50 mg/kg 1.2 times the MRHD) or greater had decreased weights, and pup survival was decreased early in lactation at 80 mg/kg (1.9 times the MRHD). Risk SummaryTramadol hydrochloride tablets are not recommended for obstetrical preoperative medication or for post-delivery analgesia in nursing mothers because its safety in infants and newborns has not been studied. Tramadol and its metabolite, O-desmethyltramadol (M1), are present in human milk. There is no information on the effects of the drug on the breastfed infant or the effects of the drug on milk production. The M1 metabolite is more potent than tramadol in mu opioid receptor binding (see CLINICAL PHARMACOLOGY). Published studies have reported tramadol and M1 in colostrum with administration of tramadol to nursing mothers in the early post-partum period. Women who are ultrarapid metabolizers of tramadol may have higher than expected serum levels of M1, potentially leading to higher levels of M1 in breast milk that can be dangerous in their breastfed infants. In women with normal tramadol metabolism, the amount of tramadol secreted into human milk is low and dose-dependent. Because of the potential for serious adverse reactions, including excess sedation and respiratory depression in a breastfed infant, advise patients that breastfeeding is not recommended during treatment with tramadol hydrochloride tablets (see WARNINGS).Clinical ConsiderationsIf infants are exposed to tramadol hydrochloride tablets through breast milk, they should be monitored for excess sedation and respiratory depression. Withdrawal symptoms can occur in breastfed infants when maternal administration of an opioid analgesic is stopped, or when breast-feeding is stopped.DataFollowing a single IV 100 mg dose of tramadol, the cumulative excretion in breast milk within 16 hours post dose was 100 mcg of tramadol (0.1% of the maternal dose) and 27 mcg of M1. InfertilityDue to effects of androgen deficiency, chronic use of opioids may cause reduced fertility in females and males of reproductive potential. It is not known whether these effects on fertility are reversible (see ADVERSE REACTIONS). The safety and effectiveness of tramadol hydrochloride tablets in pediatric patients have not been established.Life-threatening respiratory depression and death have occurred in children who received tramadol (see WARNINGS). In some of the reported cases, these events followed tonsillectomy and/or adenoidectomy, and one of the children had evidence of being an ultra-rapid metabolizer of tramadol (i.e., multiple copies of the gene for cytochrome P450 isoenzyme 2D6). Children with sleep apnea may be particularly sensitive to the respiratory depressant effects of tramadol.Because of the risk of life-threatening respiratory depression and death: •Tramadol hydrochloride tablets are contraindicated for all children younger than 12 years of age (see CONTRAINDICATIONS). •Tramadol hydrochloride tablets are contraindicated for post-operative management in pediatric patients younger than 18 years of age following tonsillectomy and/or adenoidectomy (see CONTRAINDICATIONS). •Avoid the use of tramadol hydrochloride tablets in adolescents 12 to 18 years of age who have other risk factors that may increase their sensitivity to the respiratory depressant effects of tramadol unless the benefits outweigh the risks. Risk factors include conditions associated with hypoventilation such as postoperative status, obstructive sleep apnea, obesity, severe pulmonary disease, neuromuscular disease, and concomitant use of other medications that cause respiratory depression. A total of 455 elderly (65 years of age or older) subjects were exposed to tramadol hydrochloride tablets in controlled clinical trials. Of those, 145 subjects were 75 years of age and older.In studies including geriatric patients, treatment-limiting adverse events were higher in subjects over 75 years of age compared to those under 65 years of age. Specifically, 30% of those over 75 years of age had gastrointestinal treatment-limiting adverse events compared to 17% of those under 65 years of age. Constipation resulted in discontinuation of treatment in 10% of those over 75.Respiratory depression is the chief risk for elderly patients treated with opioids, and has occurred after large initial doses were administered to patients who were not opioid-tolerant or when opioids were co-administered with other agents that depress respiration. Titrate the dosage of tramadol hydrochloride tablets slowly in geriatric patients and monitor closely for signs of central nervous system and respiratory depression (see WARNINGS).Tramadol is known to be substantially excreted by the kidney, and the risk of adverse reactions to this drug may be greater in patients with impaired renal function. Because elderly patients are more likely to have decreased renal function, care should be taken in dose selection, and it may be useful to monitor renal function. The following serious adverse reactions are described, or described in greater detail, in other sections: •Addiction, Abuse, and Misuse (see WARNINGS) •Life-Threatening Respiratory Depression (see WARNINGS) •Ultra-Rapid Metabolism of Tramadol and Other Risk Factors for Life-threatening Respiratory Depression in Children (see WARNINGS) •Neonatal Opioid Withdrawal Syndrome (see WARNINGS) •Interactions with Benzodiazepines or Other CNS Depressants (see WARNINGS) •Serotonin Syndrome (see WARNINGS) •Seizures (see WARNINGS) •Suicide (see WARNINGS) •Adrenal Insufficiency (see WARNINGS) •Severe Hypotension (see WARNINGS) •Gastrointestinal Adverse Reactions (see WARNINGS) •Hypersensitivity Reactions (see WARNINGS) •Withdrawal (see WARNINGS) Clinical Trials ExperienceBecause clinical trials are conducted under widely varying conditions, adverse reaction rates observed in the clinical trials of a drug cannot be directly compared to rates in the clinical trials of another drug and may not reflect the rates observed in practice. Tramadol hydrochloride tablets were administered to 550 patients during the double-blind or open-label extension periods in U.S. studies of chronic nonmalignant pain. Of these patients, 375 were 65 years old or older. Table 2 reports the cumulative incidence rate of adverse reactions by 7, 30 and 90 days for the most frequent reactions (5% or more by 7 days). The most frequently reported events were in the central nervous system and gastrointestinal system. Although the reactions listed in the table are felt to be probably related to tramadol hydrochloride tablets administration, the reported rates also include some events that may have been due to underlying disease or concomitant medication. The overall incidence rates of adverse experiences in these trials were similar for tramadol hydrochloride tablets and the active control groups, TYLENOL with Codeine #3 (acetaminophen 300 mg with codeine phosphate 30 mg), and aspirin 325 mg with codeine phosphate 30 mg, however, the rates of withdrawals due to adverse events appeared to be higher in the tramadol hydrochloride tablets groups.Table 2: Cumulative Incidence of Adverse Reactions for Tramadol Hydrochloride Tablets in Chronic Trials of Nonmalignant Pain (N=427) Up to 7 DaysUp to 30 DaysUp to 90 Days1 “CNS Stimulation” is a composite of nervousness, anxiety, agitation, tremor, spasticity, euphoria, emotional lability and hallucinationsDizziness/Vertigo26% 31% 33%Nausea 24% 34% 40%Constipation 24% 38% 46%Headache 18% 26% 32%Somnolence 16% 23% 25%Vomiting 9% 13% 17%Pruritus 8% 10% 11%“CNS Stimulation” 17% 11% 14%Asthenia 6% 11% 12%Sweating 6% 7% 9%Dyspepsia 5% 9%13% Dry Mouth 5% 9% 10%Diarrhea 5% 6% 10%Incidence 1% to less than 5% possibly causally related:The following lists adverse reactions that occurred with an incidence of 1% to less than 5% in clinical trials, and for which the possibility of a causal relationship with tramadol hydrochloride tablets exists.Body as a Whole: Malaise.Cardiovascular: Vasodilation.Central Nervous System: Anxiety, Confusion, Coordination disturbance, Euphoria, Miosis, Nervousness, Sleep disorder.Gastrointestinal: Abdominal pain, Anorexia, Flatulence.Musculoskeletal: Hypertonia.Skin: Rash.Special Senses: Visual disturbance.Urogenital: Menopausal symptoms, Urinary frequency, Urinary retention.Incidence less than 1%, possibly causally related:The following lists adverse reactions that occurred with an incidence of less than 1% in clinical trials of tramadol and/or reported in post-marketing experience with tramadol-containing products.Body as a Whole: Accidental injury, Allergic reaction, Anaphylaxis, Death, Suicidal tendency, Weight loss, Serotonin syndrome (mental status change, hyperreflexia, fever, shivering, tremor, agitation, diaphoresis, seizures and coma).Cardiovascular: Orthostatic hypotension, Syncope, Tachycardia.Central Nervous System: Abnormal gait, Amnesia, Cognitive dysfunction, Delirium, Depression, Difficulty in concentration, Hallucinations, Movement disorder, Paresthesia, Seizure, Speech disorder, Tremor.Metabolism and Nutrition Disorders: Cases of hypoglycemia have been reported very rarely in patients taking tramadol. Most reports were in patients with predisposing risk factors, including diabetes or renal insufficiency, or in elderly patients.Respiratory: Dyspnea.Skin: Stevens-Johnson syndrome/Toxic epidermal necrolysis, Urticaria, Vesicles.Special Senses: Dysgeusia, Mydriasis.Urogenital: Dysuria, Menstrual disorder.Other adverse experiences, causal relationship unknown:A variety of other adverse events were reported infrequently in patients taking tramadol hydrochloride tablets during clinical trials and/or reported in post-marketing experience. A causal relationship between tramadol hydrochloride tablets and these events has not been determined. However, the most significant events are listed below as alerting information to the physician.Cardiovascular: Abnormal ECG, Hypertension, Hypotension, Myocardial ischemia, Palpitations, Pulmonary edema, Pulmonary embolism.Central Nervous System: Migraine.Gastrointestinal: Gastrointestinal bleeding, Hepatitis, Stomatitis, Liver failure.Laboratory Abnormalities: Creatinine increase, Elevated liver enzymes, Hemoglobin decrease, Proteinuria.Sensory: Cataracts, Deafness, Tinnitus.Post-marketing ExperienceSerotonin syndrome: Cases of serotonin syndrome, a potentially life-threatening condition, have been reported during concomitant use of opioids with serotonergic drugs.Adrenal insufficiency: Cases of adrenal insufficiency have been reported with opioid use, more often following greater than one month of use.Androgen deficiency: Cases of androgen deficiency have occurred with chronic use of opioids (see CLINICAL PHARMACOLOGY).QT prolongation/torsade de pointes: Cases of QT prolongation and/or torsade de pointes have been reported with tramadol use. Many of these cases were reported in patients taking another drug labeled for QT prolongation, in patients with a risk factor for QT prolongation (e.g., hypokalemia), or in the overdose setting. Tramadol hydrochloride tablets (tramadol hydrochloride) contain tramadol, a Schedule IV controlled substance. Tramadol hydrochloride tablets contain tramadol, a substance with a high potential for abuse similar to other opioids. Tramadol hydrochloride tablets can be abused and is subject to misuse, addiction, and criminal diversion (see WARNINGS).All patients treated with opioids require careful monitoring for signs of abuse and addiction, because use of opioid analgesic products carries the risk of addiction even under appropriate medical use.Prescription drug abuse is the intentional non-therapeutic use of a prescription drug, even once, for its rewarding psychological or physiological effects.Drug addiction is a cluster of behavioral, cognitive, and physiological phenomena that develop after repeated substance use and includes: a strong desire to take the drug, difficulties in controlling its use, persisting in its use despite harmful, or potentially harmful, consequences, a higher priority given to drug use than to other activities and obligations, increased tolerance, and sometimes a physical withdrawal.“Drug-seeking” behavior is very common in persons with substance use disorders. Drug-seeking tactics include emergency calls or visits near the end of office hours, refusal to undergo appropriate examination, testing or referral, repeated “loss” of prescriptions, tampering with prescriptions and reluctance to provide prior medical records or contact information for other treating physician(s). “Doctor shopping” (visiting multiple prescribers to obtain additional prescriptions) is common among drug abusers and people suffering from untreated addiction. Preoccupation with achieving adequate pain relief can be appropriate behavior in a patient with poor pain control.Abuse and addiction are separate and distinct from physical dependence and tolerance. Healthcare providers should be aware that addiction may not be accompanied by concurrent tolerance and symptoms of physical dependence in all addicts. In addition, abuse of opioids can occur in the absence of true addiction.Tramadol hydrochloride tablets, like other opioids, can be diverted for non-medical use into illicit channels of distribution. Careful record-keeping of prescribing information, including quantity, frequency, and renewal requests, as required by state and federal law, is strongly advised.Proper assessment of the patient, proper prescribing practices, periodic re-evaluation of therapy, and proper dispensing and storage are appropriate measures that help to limit abuse of opioid drugs.Risks Specific to Abuse of Tramadol Hydrochloride TabletsTramadol hydrochloride tablets are intended for oral use only. Abuse of tramadol hydrochloride tablets poses a risk of overdose and death. The risk is increased with concurrent abuse of tramadol hydrochloride tablets with alcohol and other central nervous system depressants.Parenteral drug abuse is commonly associated with transmission of infectious diseases such as hepatitis and HIV. Both tolerance and physical dependence can develop during chronic opioid therapy. Tolerance is the need for increasing doses of drugs to maintain a defined effect such as analgesia (in the absence of disease progression or other external factors). Tolerance may occur to both the desired and undesired effects of drugs, and may develop at different rates for different effects.Physical dependence results in withdrawal symptoms after abrupt discontinuation or a significant dosage reduction of a drug. Withdrawal also may be precipitated through the administration of drugs with opioid antagonist activity (e.g., naloxone, nalmefene), mixed agonist/antagonist analgesics (pentazocine, butorphanol, nalbuphine), or partial agonists (buprenorphine). Physical dependence may not occur to a clinically significant degree until after several days to weeks of continued opioid usage.Tramadol hydrochloride tablets should not be abruptly discontinued in a physically dependent patient (see DOSAGE AND ADMINISTRATION). If tramadol hydrochloride tablets are abruptly discontinued in a physically-dependent patient, a withdrawal syndrome may occur. Some or all of the following can characterize this syndrome: restlessness, lacrimation, rhinorrhea, yawning, perspiration, chills, myalgia, and mydriasis. Other signs and symptoms also may develop, including: irritability, anxiety, backache, joint pain, weakness, abdominal cramps, insomnia, nausea, anorexia, vomiting, diarrhea, or increased blood pressure, respiratory rate, or heart rate.Infants born to mothers physically dependent on opioids will also be physically dependent and may exhibit respiratory difficulties and withdrawal signs (see PRECAUTIONS; Pregnancy). Clinical PresentationAcute overdosage with tramadol hydrochloride tablets can be manifested by respiratory depression, somnolence progressing to stupor or coma, skeletal muscle flaccidity, cold and clammy skin, constricted pupils, and, in some cases, pulmonary edema, bradycardia, QT prolongation, hypotension, partial or complete airway obstruction, atypical snoring, seizures, and death. Marked mydriasis rather than miosis may be seen with hypoxia in overdose situations.Deaths due to overdose have been reported with abuse and misuse of tramadol (see WARNINGS; Addiction, Abuse, and Misuse). Review of case reports has indicated that the risk of fatal overdose is further increased when tramadol is abused concurrently with alcohol or other CNS depressants, including other opioids.Treatment of OverdoseIn case of overdose, priorities are the re-establishment of a patent and protected airway and institution of assisted or controlled ventilation, if needed. Employ other supportive measures (including oxygen and vasopressors) in the management of circulatory shock and pulmonary edema as indicated. Cardiac arrest or serious arrhythmias will require advanced life-supporting measures.The opioid antagonists, naloxone or nalmefene, are specific antidotes to respiratory depression resulting from opioid overdose. For clinically significant respiratory or circulatory depression secondary to tramadol overdose, administer an opioid antagonist. Opioid antagonists should not be administered in the absence of clinically significant respiratory or circulatory depression secondary to tramadol overdose.While naloxone will reverse some, but not all, symptoms caused by overdosage with tramadol, the risk of seizures is also increased with naloxone administration. In animals, convulsions following the administration of toxic doses of tramadol hydrochloride tablets could be suppressed with barbiturates or benzodiazepines but were increased with naloxone. Naloxone administration did not change the lethality of an overdose in mice. Hemodialysis is not expected to be helpful in an overdose because it removes less than 7% of the administered dose in a 4-hour dialysis period.Because the duration of opioid reversal is expected to be less than the duration of action of tramadol in tramadol hydrochloride tablets, carefully monitor the patient until spontaneous respiration is reliably re-established. If the response to an opioid antagonist is suboptimal or only brief in nature, administer additional antagonist as directed by the product's prescribing information.In an individual physically dependent on opioids, administration of the recommended usual dosage of the antagonist will precipitate an acute withdrawal syndrome. The severity of the withdrawal symptoms experienced will depend on the degree of physical dependence and the dose of the antagonist administered. If a decision is made to treat serious respiratory depression in the physically dependent patient, administration of the antagonist should be begun with care and by titration with smaller than usual doses of the antagonist. Adults (17 years of age and over)Important Dosage and Administration InstructionsUse the lowest effective dosage for the shortest duration consistent with individual patient treatment goals (see WARNINGS).Initiate the dosing regimen for each patient individually, taking into account the patient's severity of pain, patient response, prior analgesic treatment experience, and risk factors for addiction, abuse, and misuse (see WARNINGS).Monitor patients closely for respiratory depression, especially within the first 24-72 hours of initiating therapy and following dosage increases with tramadol hydrochloride tablets and adjust the dosage accordingly (see WARNINGS).Initial DosageInitiating Treatment with Tramadol Hydrochloride TabletsFor patients with moderate to moderately severe chronic pain not requiring rapid onset of analgesic effect, the tolerability of tramadol hydrochloride tablets can be improved by initiating therapy with the following titration regimen: The total daily dose may be increased by 50 mg as tolerated every 3 days to reach 200 mg/day (50 mg four times a day). After titration, tramadol hydrochloride tablets 50 to 100 mg can be administered as needed for pain relief every 4 to 6 hours not to exceed 400 mg/day.For the subset of patients for whom rapid onset of analgesic effect is required and for whom the benefits outweigh the risk of discontinuation due to adverse events associated with higher initial doses, tramadol hydrochloride tablets 50 mg to 100 mg can be administered as needed for pain relief every four to six hours, not to exceed 400 mg per day.Conversion from Tramadol Hydrochloride Tablets to Extended-Release TramadolThe relative bioavailability of tramadol hydrochloride tablets compared to extended-release tramadol is unknown, so conversion to extended-release formulations must be accompanied by close observation for signs of excessive sedation and respiratory depression.Dosage Modification in Patients with Hepatic ImpairmentThe recommended dose for adult patients with cirrhosis is 50 mg every 12 hours.Dosage Modification in Patients with Renal ImpairmentIn all patients with creatinine clearance less than 30 mL/min, it is recommended that the dosing interval of tramadol hydrochloride tablets be increased to 12 hours, with a maximum daily dose of 200 mg. Since only 7% of an administered dose is removed by hemodialysis, dialysis patients can receive their regular dose on the day of dialysis.Dosage Modification in Geriatric PatientsIn general, dose selection for an elderly patient over 65 years old should be cautious, usually starting at the low end of the dosing range, reflecting the greater frequency of decreased hepatic, renal or cardiac function and of concomitant disease or other drug therapy. For elderly patients over 75 years old, total dose should not exceed 300 mg/day.Titration and Maintenance of TherapyIndividually titrate tramadol hydrochloride tablets to a dose that provides adequate analgesia and minimizes adverse reactions. Continually reevaluate patients receiving tramadol hydrochloride tablets to assess the maintenance of pain control and the relative incidence of adverse reactions, as well as monitoring for the development of addiction, abuse, or misuse (see WARNINGS). Frequent communication is important among the prescriber, other members of the healthcare team, the patient, and the caregiver/family during periods of changing analgesic requirements, including initial titration.If the level of pain increases after dosage stabilization, attempt to identify the source of increased pain before increasing the tramadol hydrochloride tablets dosage. If unacceptable opioid-related adverse reactions are observed, consider reducing the dosage. Adjust the dosage to obtain an appropriate balance between management of pain and opioid-related adverse reactions.Discontinuation of Tramadol Hydrochloride TabletsWhen a patient who has been taking tramadol hydrochloride tablets regularly and may be physically dependent no longer requires therapy with tramadol hydrochloride tablets, taper the dose gradually, by 25% to 50% every 2 to 4 days, while monitoring carefully for signs and symptoms of withdrawal. If the patient develops these signs or symptoms, raise the dose to the previous level and taper more slowly, either by increasing the interval between decreases, decreasing the amount of change in dose, or both. Do not abruptly discontinue tramadol hydrochloride tablets in a physically-dependent patient. (see WARNINGS; Drug Abuse and Dependence). Tramadol hydrochloride tablets, USP 50 mg are available as white capsule shaped film coated tablets, debossed with “377” on one side and plain on the other side. Bottles of 15'sNDC68788-7321-5 Bottles of 20'sNDC68788-7321-2 Bottles of 30'sNDC68788-7321-3 Bottles of 40'sNDC68788-7321-4 Bottles of 50'sNDC68788-7321-7 Bottles of 60'sNDC68788-7321-6 Bottles of 90'sNDC68788-7321-9 Bottles of 100'sNDC68788-7321-1 Bottles of 120'sNDC68788-7321-8Dispense in tight container.Store at 20°C to 25°C (68°F to 77°F); excursions permitted to 15°C to 30°C (59°F to 86°F). [see USP Controlled Room Temperature].Distributed By:Sun Pharmaceutical Industries, Inc.Cranbury, NJ 08512PGPI0173KRev. 11/2018Repackaged By: Preferred Pharmaceuticals Inc.
Tramadol Hydrochloride Tablets, USP(TRAM a dol hye” droe cklo' ride"), CIVTramadol hydrochloride tablets are: •A strong prescription pain medicine that contains an opioid (narcotic) that is used for the management pain in adults, when other pain treatments such as non-opioid pain medicines do not treat your pain well enough or you cannot tolerate them. •An opioid pain medicine that can put you at risk for overdose and death. Even if you take your dose correctly as prescribed you are at risk for opioid addiction, abuse, and misuse that can lead to death.Important information about tramadol hydrochloride tablets: •Get emergency help right away if you take too much tramadol hydrochloride tablets (overdose). When you first start taking tramadol hydrochloride tablets, when your dose is changed, or if you take too much (overdose), serious or life-threatening breathing problems that can lead to death may occur. •Taking tramadol hydrochloride tablets with other opioid medicines, benzodiazepines, alcohol, or other central nervous system depressants (including street drugs) can cause severe drowsiness, decreased awareness, breathing problems, coma, and death. •Never give anyone else your tramadol hydrochloride tablets. They could die from taking it. Store tramadol hydrochloride tablets away from children and in a safe place to prevent stealing or abuse. Selling or giving away tramadol hydrochloride tablets is against the law.Important information guiding use in pediatric patients: •Do not give tramadol hydrochloride tablets to a child younger than 12 years of age. •Do not give tramadol hydrochloride tablets to a child younger than 18 years of age after surgery to remove the tonsils and/or adenoids. •Avoid giving tramadol hydrochloride tablets to children between 12 to 18 years of age who have risk factors for breathing problems such as obstructive sleep apnea, obesity, or underlying lung problems.Do not take tramadol hydrochloride tablets if you have: •Severe asthma, trouble breathing, or other lung problems. •A bowel blockage or have narrowing of the stomach or intestines. •An allergy to tramadol. •Taken a Monoamine Oxidase Inhibitor, MAOI, (medicine used for depression) within the last 14 days.Before taking tramadol hydrochloride tablets, tell your healthcare provider if you have a history of: •head injury, seizures •liver, kidney, thyroid problems •problems urinating •pancreas or gallbladder problems •abuse of street or prescription drugs, alcohol addiction, or mental health problems.Tell your healthcare provider if you are: •pregnant or planning to become pregnant. Prolonged use of tramadol hydrochloride tablets during pregnancy can cause withdrawal symptoms in your newborn baby that could be life-threatening if not recognized and treated. •breastfeeding. Not recommended; it may harm your baby. •taking prescription or over-the-counter medicines, vitamins, or herbal supplements. Taking tramadol hydrochloride tablets with certain other medicines can cause serious side effects that could lead to death.When taking tramadol hydrochloride tablets: •Do not change your dose. Take tramadol hydrochloride tablets exactly as prescribed by your healthcare provider. Use the lowest dose possible for the shortest time needed. •Take your prescribed dose as indicated by your healthcare provider. The maximum dosage is 1 or 2 tablets every 4 to 6 hours, as needed for pain relief. Do not take more than your prescribed dose and do not take more than 8 tablets per day. If you miss a dose, take your next dose at your usual time. •Call your healthcare provider if the dose you are taking does not control your pain. •If you have been taking tramadol hydrochloride tablets regularly, do not stop taking tramadol hydrochloride tablets without talking to your healthcare provider. •After you stop taking tramadol hydrochloride tablets, ask your pharmacist how to dispose of any unused tablets.While taking tramadol hydrochloride tablets DO NOT: •Drive or operate heavy machinery, until you know how tramadol hydrochloride tablets affect you. Tramadol hydrochloride tablets can make you sleepy, dizzy, or lightheaded. •Drink alcohol or use prescription or over-the-counter medicines that contain alcohol. Using products containing alcohol during treatment with tramadol hydrochloride tablets may cause you to overdose and die.The possible side effects of tramadol hydrochloride tablets: •constipation, nausea, sleepiness, vomiting, tiredness, headache, dizziness, abdominal pain. Call your healthcare provider if you have any of these symptoms and they are severe. Get emergency medical help if you have: •trouble breathing, shortness of breath, fast heartbeat, chest pain, swelling of your face, tongue, or throat, extreme drowsiness, light-headedness when changing positions, feeling faint, agitation, high body temperature, trouble walking, stiff muscles, or mental changes such as confusion.These are not all the possible side effects of tramadol hydrochloride tablets. Call your doctor for medical advice about side effects. You may report side effects to FDA at 1-800-FDA-1088. For more information go to dailymed.nlm.nih.govwww.sunpharma.com or call 1-800-818-4555Distributed by:Sun Pharmaceutical Industries, Inc.Cranbury, NJ 08512This Medication Guide has been approved by the U.S. Food and Drug Administration.Rev. 11/2018PGPI0345CRepackaged By: Preferred Pharmaceuticals Inc.